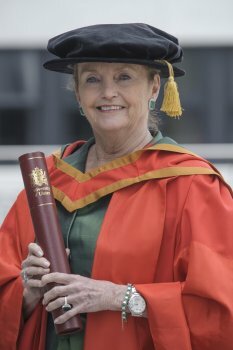 Distinguished US philanthropist Loretta Brennan Glucksman will today receive the honorary degree of Doctor of Laws, (LLD), in recognition of her services to peace and reconciliation in Ireland and Northern Ireland. A third generation Irish-American, she grew up in Pennsylvania and trained as a teacher, later becoming a news and public affairs producer for television. With her second husband, Lew Glucksman –who had a passionate interest in Irish literature – she embarked on a mission to make a philanthropic contribution to Ireland, funding such institutions as the Glucksman Map Library at TCD, and the Glucksman Gallery at UCC. They also established the Glucksman Ireland House, a centre for Irish culture at New York University. She is also Chairperson of the American Ireland Fund, the largest worldwide network of people of Irish ancestry and friends of Ireland, dedicated to raising funds to support programs of peace, reconciliation, art and culture throughout the island of Ireland. In November 2012, she received a Presidential Distinguished Service Award for Irish Abroad in recognition of her outstanding contribution to Ireland and the Irish community overseas.